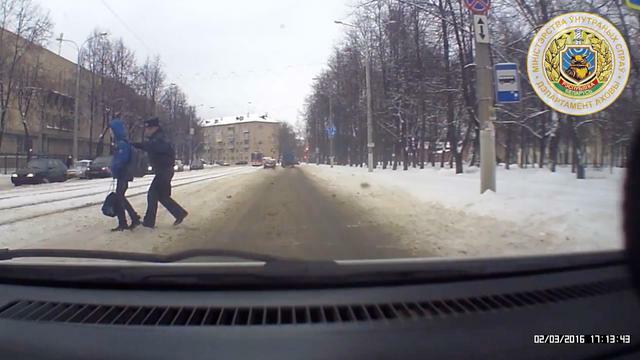 A police officer's effort to save a child in Belarus has been caught on video. The dashcam recording dated March 2nd shows the man, identified as Sergei Batalko, walking across a snow-lined street with a juvenile wearing a backpack. Once they reach the center of the road, the man grabs the child as a van veers towards the duo and hits them. The pair can be seen rolling off the car's hood and landing on the ground then getting back up shortly after; the vehicle appears to stop. The country's Ministry of Internal Affairs has since issued a statement saying that the child sustained no injuries, but the officer's leg was bruised.